The Young Stars Classic rookie tournament continued on Sunday with Calgary in action against the Vancouver Canucks, who are very much the home team in this event. But there would be no joy for the fans in blue, only for the boisterous pockets of red clad Flames supporters. An early 2-0 lead for the Flames was eventually erased but Calgary quickly retook a two-goal lead heading to the second intermission. Two more in the third made it a 6-2 final. Just OK on Friday night, Foo was far more noticeable on Sunday afternoon and was one of the best players on the ice, scoring twice (sorta) and also ringing a shot off the crossbar. "It's nice to get some confidence back and have some pucks go in the net," Foo said. Now full disclosure, Foo did say post-game he didn't get his stick on the first goal that was credited to him but we'll call it two goals anyway as that's the way it was announced and it still appears that way on the official game sheet. Plus, he was right there anyway and easily could have deflected it. That opening goal was a real slick display of skill from Calgary's top line that began with a Foo pass to Mangiapane as the trio gained the Canucks zone with speed. As Mangiapane drove towards the slot to take away a defenceman, he neatly curled and sent a perfect outlet pass to Jankowski steaming down the boards. Jankowski promptly zipped a pass through the crease towards Foo driving the far post and his stick was right there for the tap-in, although it appears it deflected off the stick of the Canucks defenceman and not Foo. It's only been two games but we're learning that Foo is a shooter and that's OK. Fishing for the hat-trick, he had multiple cracks at that third goal and wasn't afraid to rip shots from from anywhere. "When he's feeling good about his game, when he's got the confidence or swagger going, I think you're going to see him score quite a few goals," says Flames rookie tournament coach Ryan Huska. His for-sure goal was a wicked one-time top-shelf slapper from the high slot on the man advantage. "It's nice to see a guy on the power play that isn't afraid to shoot," Huska says. "Because a lot of times you have guys that always feel like they have to move it or make that perfect pass. He seems to be the type of guy who has a shoot-first mentality and every good power play needs to have someone like that." The other thing that pops for Huska, about Foo, is he's always around the puck. "He's on top of pucks like a dog on a bone, he's a guy who's always around it," says Huska. "He's been around the play a lot and you can see that he has the ability to make plays, both moving the puck with his linemates tonight and finishing." 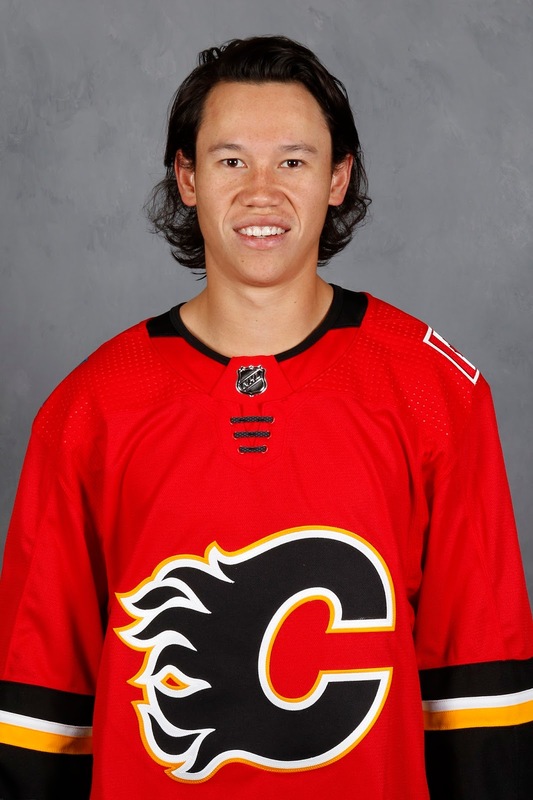 I'm not sure Foo will start the year in the NHL but you start to see the attributes that made him a sought after player and a player that will find himself in Calgary sooner than later. "At the end of the day, you just want to show well, play hard and compete hard out there in both ends of the ice," Foo said. "This was one of those nights where the bounces went your way." 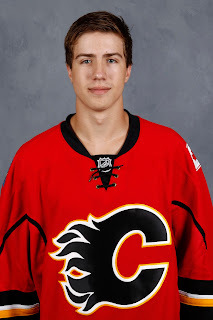 Ranked 37th among North American skaters by NHL Central Scouting, 48th by International Scouting Service (ISS) and 59th by Future Considerations, the Flames landed 6-foot-4 Slovakian centre Adam Ruzicka with pick No. 109 in the 2017 NHL Draft. Centring free agent invitee Brad Morrison and speedy Matthew Phillips on Sunday, the little-bit-of-everything trio had a nice showing and were involved in the play throughout the game. "I had two really fast and skilled players that I can exchange the puck with, so I was pretty happy about it," Ruzicka said. "I settled in pretty good with them, played really good hockey and had so many chances." The Ruzicka goal at 9:28 of the second period was the game-winner, breaking a 2-2 tie. After he got stopped on a wraparound attempt, he stayed with it and knocked in the rebound. "The first goal is always the beautiful one," said the 18-year-old. "It's a good feeling to score the first goal as a Flame. My game, the goals come from hard work down low. " Ruzicka also drew a penalty with a nice play in which he split the Canucks D and almost had a breakaway before being hauled down. Throughout the afternoon, there was a lot to like about Ruzicka's game. "I thought he was using his body real effectively in the offensive zone. For a young guy, he's a big man, and if he positions himself the right way, he'll make it real difficult for people to take pucks from," said Huska. "For him, it's finding time to grow his game and learning how to play more straight line and at times, pushing himself to get places quicker." Already, there's a lot to like about his make-up. "He's got the quiet confidence about him," Huska said. "When he really learns how to be a dominant player, he'll learn those habits and tricks that will help him take the next step." 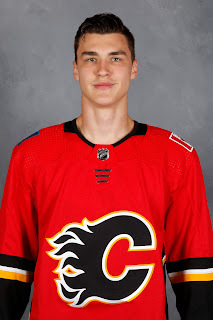 With Tyler Parsons nursing a minor injury that forced him to leave practice early on Saturday, Nick Schneider got the start for Calgary and had a real good game in making 25 saves. 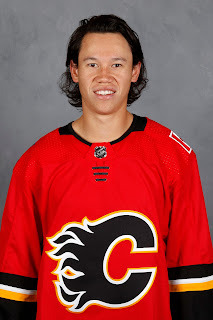 Schneider was traded to the Calgary Hitmen in the off-season so he will spend his overage season in the WHL playing right under the nose of Flames management at the Calgary Saddledome. That said, don't expect that to rattle the young man. He was playing in front of the Flames management team on Sunday afternoon too and he didn't look nervous at all. "I felt good in the net. It was nice to watch the game yesterday, feel out the speed and the plays that are happening. I felt like I was tracking the puck well," said Schneider, who played the last four seasons with the Medicine Hat Tigers. Schneider's situation is obviously an interesting one. 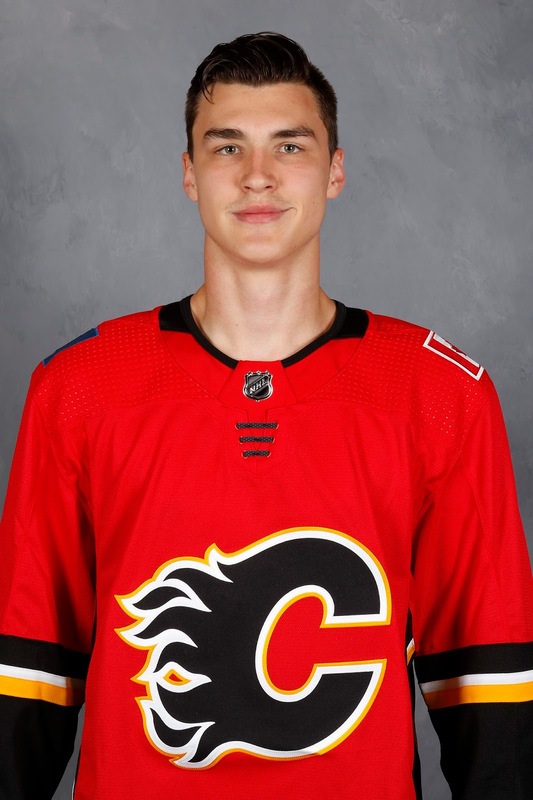 With the Flames goaltender prospect list jammed with Jon Gillies, David Rittich, Tyler Parsons and Mason McDonald, there's no place for him to go right now except for back to junior. That said, the one consolation worth noting for him is that he did get the start on Saturday ahead of McDonald, who was a second round pick back in 2014. That does make one imply what the pecking order on the depth chart might look like at this point. As soon as the game started, it didn't take long for Schneider to get into it. "In a tournament like this, the first period you have to jump right into," he said. 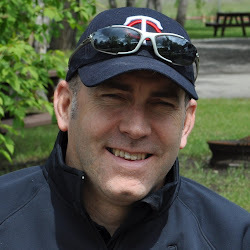 "After that, you get more accustomed to it and you get really into the game. You're wearing NHL sweaters so obviously you're pretty into it and excited so I don't think it's very hard to keep focused." Asked for his favourite save, Schneider pointed to his breakaway stop in the second period. For me, I just liked his overall body of work. A couple times he jabbed out his pad to thwart a player cutting across the crease. In a couple other sequences, he made a nice first stop then smoothly handled the rebound(s). Sunday was a great opportunity to catch a glimpse of what Stockton's No. 1 power play could look like in 2017-18. Going with the configuration of four forwards and one defence as both Calgary and Stockton did with one of their two power play units last year, the top line of Jankowski, Mangiapane and Foo passed the puck around smartly, creating multiple chances. The net-front presence role was split between Hunter Smith (not so good) and Zach Fischer (good). "Everybody was moving the puck sharply and we ended up with a couple pucks in the net," said Foo. "Those are easy guys to play with. A lot of guys would want to be playing with them. I'm in a good position right now. It's fun out there." Meanwhile, quarterbacking the man advantage from as the high guy in the 1-3-1 set-up was Swedish blueliner Rasmus Andersson. "Rasmus was really good," said Huska. "This was a game where I thought he had the confidence going. When he moves his feet, when he's quick with his decision-making, when he's assertive, he's a very good player because he thinks the game well." 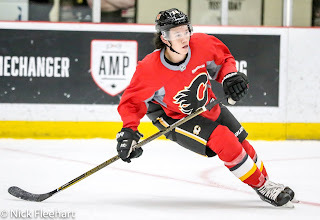 The new, leaner Andersson -- down to around 210 pounds as of fitness testing, a noticeable drop from the 220 or so he was at for development camp -- had two primary assists and could have had at least one more. It was his feed that sprung Ruzicka on that aforementioned breakaway. "Played a lot of minutes, was good on our power play and he did a good job of keeping his game simple at the times he needed to," Huska said. 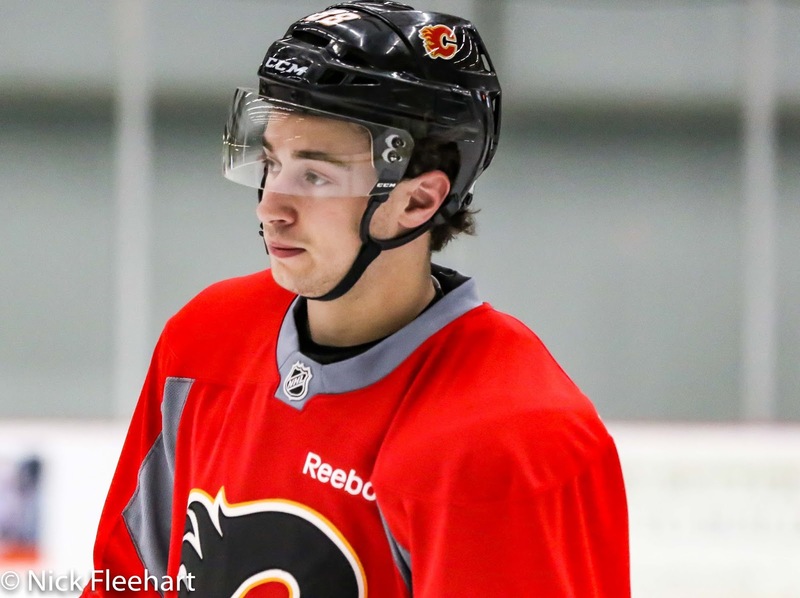 Impressing me just like he impressed Flames scouts last season was Zach Fischer. This is Calgary's fifth round pick in 2017, who was passed over in the draft his first two years of eligibility before being selected by the Flames this year. 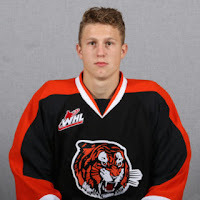 To refresh your memory, this is the guy, who had only mustered 23 points (12 goals, 11 assists) and 38 penalty minutes in 89 games in his first two WHL seasons with Medicine Hat. Then last year, he bulked up and in 62 games, he racked up 63 points (34 goals, 29 assists) and a whopping 145 penalty minutes. It was quite the stirring transformation. "I needed to work on my skating, I needed to put a little bit of size on. For me, to be in a bigger role, to be a bigger guy, to go out there and play physical, I have to put on size. I have to be stronger so I just went out there and did that in the off-season and it paid off," says Fischer. "I just worried about playing a fast, physical game and the playmaking and the points came out." The mean streak is perhaps most fascinating. He had one fight in each of his first two seasons. Last year, he had 15 -- 13 in the regular season, 2 in the playoffs. "A lot of guys in the dressing room would say I have a little switch that goes off. It's good and bad, but I like it, it's part of who I am," he says. Someone who witnessed this evolution in Fischer's game from up-close was his ex-teammate in Medicine Hat. "Fish is a guy that has tons of tools," says Schneider, who played three years with him. "He's a tough kid, he can fight, obviously you saw today he can put the puck in the net, he's a skilled player. It was cool for me as I've seen him evolve from a rookie at 17. Throughout this past year, he just kept getting better and better, whether it was the toughness or the fighting or the shooting or the skill." All of those alluring attributes were on display against the Canucks. He scored a goal, made a few nice set-ups -- especially during his time on the power play when he replaced Smith. If you isolate on him away from the puck, you'll see him frequently giving someone a little pop with his stick, a shove, or a verbal jab. He's a handful. "He's a big man that shoots the puck really well. Tonight, what surprised me a little bit with his skating ability, said Huska. "He was involved as well. When you've got big, heavier guys that can move around and are competitive like he was tonight, they're difficult to handle. He's a big man that plays a hard game and that's difficult to defend against." After losing 4-2 on Friday night in a game where only a handful of players stood out, on this night you can tell early that Calgary had come to play. 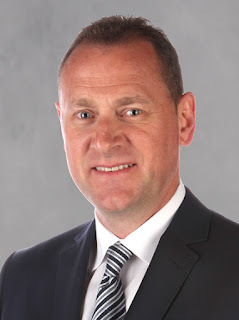 One wonders if GM Brad Treliving needed to repeat his message from the start of rookie camp -- stand out, don't blend in. Dillon Dube - Constantly darting and dashing with the puck. Andrew Mangiapane - So crafty. He got his share of scoring chances. Josh Healey - Still stapling unsuspecting forwards, but cut down on mistakes. Honourable mention goes to Brett Pollock, who after being quiet for two periods after a decent game on Friday, went end to end on a beautiful rush that he capped off with a slick finish in-close to make it 5-2. "I got the puck with some speed on the wall and one thing I want to do more is use my size and take things to the net," Pollock said. "I saw an opportunity and got around that d-man, got my shoulder down and just took it to the net." Pollock would add another another into an empty net to round out the scoring. The other guy that caught my eye in his Penticton debut was free agent invitee Ben Hawerchuk, who plays for his Dad in Barrie (OHL) and through his time there is familiar with former teammates Mangiapane and Andersson. Playing left wing on a line with Dube, Hawerchuk had an assist and was involved in a number of scoring chances. I know Hunter Smith has taken a lot of heat, but I also recall Sam Cosentino coming on Fan960 prior to the draft that year speaking highly of Smith. No, he's not been very good but he also wasn't a HUGE reach in the draft in 2014.He was ranked 39th among North American skaters so picking him at 54th wasn't exactly going off the board. It doesn't look like he has a future in the NHL, which would place him in good company with the hundreds (if not thousands) of second round busts before him.